Things don’t just appear on the phone screen out of the blue. Showing the user how the UI elements fit together, where they come from, and where they go, is the cornerstone of a great user experience. You may already know that animating the appearance of something can be straightforward. But what about when something needs to be hidden? If the component is already unmounted, how do you even animate its disappearance? But then, how does everyone have that? And not just everyone, but how can you make something like this? But we don’t want this component just to appear, we want to fade it in. The thing is, it would not animate on unmount — because once showRectView is false, Fade will be unmounted too, and will not have a chance to animate the view out. What we want is the way to keep rendering RectView until the animation has finished. And the Fade component is the best place to handle that. Need for change: we want its children to change opacity from 0 to 1, and scale from 1.1 to 1.0 when appearing; and the other way around when disappearing. Visual state: our visual state will be the visibility of its children, which runs from 0 (hidden) to 1 (visible). Transitions: this can be anything. We can use the simplest one, timing. The pixels: we will map the 0-1 visibility value into opacity between 0 and 1, and transform’s scale between 1.1 and 1.0. Want a handy little PDF to help you recall the building blocks? You can download the cheatsheet below. Otherwise keep reading. 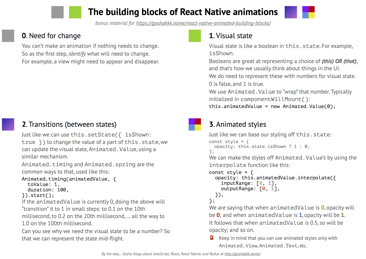 Exclusive bonus: Download the free Building blocks of React Native animations cheatsheet that you can print out or have handy on your desktop. I'll email it to you right away so you can access it from anywhere! The thing is, it keeps rendering children with opacity = 0 even when visible=false. But we don’t want that, of course. One idea might be to render anything when this.props.visible is true, but this still has the drawbacks of the conditional rendering solution. Instead, we need to be able to unmount the children after the animation has finished running. when the visible prop becomes true, set the visible in the state to true immediately. when the visible prop becomes false, set the visible in the state to false after the animation has finished.